In a new edition of her "Letters from Brussels", Ceasefire correspondent Emily Macintosh reports on a powerful art exhibition that got her thinking about the problems surrounding social housing provision in Brussels and Glasgow. 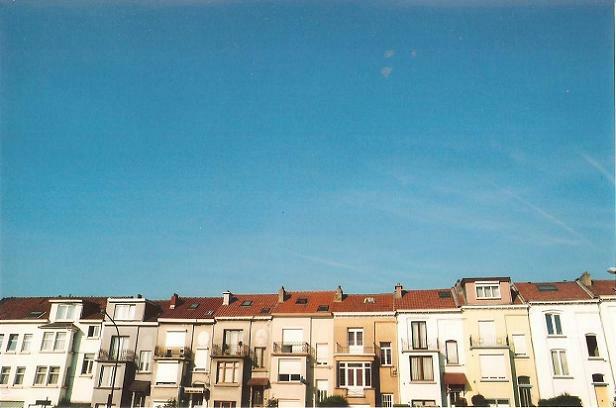 Houses in Watermael-Boisfort, a suburban area of Brussels popular with families and commuters due to its relative proximity to both the countryside outside of the city and the business district and European quarter. The buildings around us can evoke many feelings. They are the witnesses of time’s steady march, the visual representation of the urban environment’s intertwining tales, both starkly evident for what they tell us, and equally prevalent for the stories that their walls can hide. Buildings can plainly lay out the inequalities in our society, and unashamedly guard the pomp and grandeur of times past that we still like to revel in today. But they can show us too how we can be innovative in our approach to using the space we have. An exhibition recently on display in Brussels’ Bozar Centre for Fine Arts titled Building for Brussels – Architecture and Urban transformation in Europe, asked us to look at the urban landscape around us and think about the relationship it has with social problems. The exhibition naturally got me thinking about architectural comparisons between Glasgow, where I lived before, and Brussels, comparisons which normally stay within the bounds of art nouveau, with both cities having played host to pioneers of the movement at the turn of the century. But a common point less likely to be lauded is the fact that Glasgow and Brussels also both share long problematic histories when it comes to social housing. In Glasgow many failed housing projects continue to be pulled down amid the mixed emotions of former residents. These famously badly built and badly planned high rise housing schemes were built predominantly in the 60s to re-house people from tenement slums. And over the last decade controversy has surrounded the two-stage transfer of housing stock and the break up of housing associations, calling into question the role of the state in housing provision, amid worries about increasing moves towards privatisation. Brussels, a city which has only recently been able to administer its own housing policy thanks to a complex tiered administrative system, is currently faced with a huge lack of social housing, leaving the most economically vulnerable with few options but to seek housing in the private rental market. Since the 19th century the wealthiest have moved out of Brussels’ inner city to the outer fringes, at first often due to the state of disrepair of many of the old houses concentrated in the city centre. This trend continued throughout the 20th century as waves of young families and well-educated people moved further out of the city centre in search of cheaper housing and a garden. But although there was a large exodus from the city, at the same time the population grew rapidly thanks to large numbers of migrants moving into the inner parts of the city, saving them from abandonment. Recent research has shown that as a result of a high birth rate and high immigration, particularly among poorer sections of the population, the city has an annual growth rate of 6% which could rise to 8.2% over the coming ten years; the city will therefore have between 60,000 and 82,000 new residents every year. 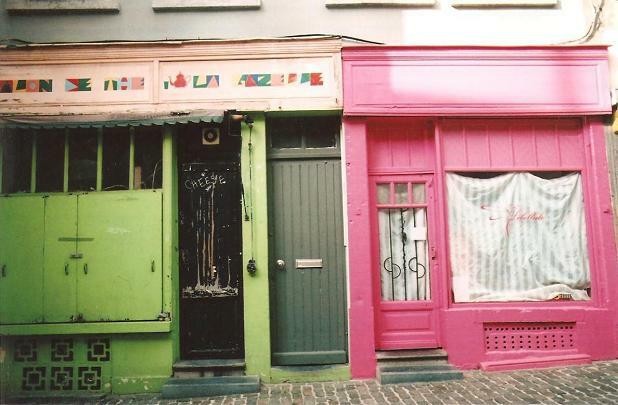 The inner city areas of Brussels have gone through many changes in recent years. Les Marolles area, a traditional working class neighbourhood, has become a popular place for people from all walks of life to life. To meet the housing demands of this increasing population, Brussels will need 50, 000 new homes by 2020, with a significant number of these being social homes. In 2007, Brussels had 39,030 social homes, representing 8.4% of the total housing stock. Compared to other cities this is quite a low figure; Paris has 16%, London has 25% and Amsterdam has as much as 55%. The volume of new subsidised housing construction is not keeping pace with that of private rentals and public housing outside the subsidised rental sector. The situation is not helped by factors such as people living in smaller numbers, a slow rotation rate of social housing and the debt of housing companies. Regional authorities have also focused their efforts on renovating the existing stock, investing millions of euros in order to get a certain number of low-income housing units to comply with the Brussels Housing Code. But things are not moving very fast, and with such a low level of social housing the private rental sector is serving as de facto social housing, with the largest proportion of low-income households being part of the private rental sector. Those living in inner city working class neighbourhoods are left with little option but to search for housing in the relatively unregulated private sector. Tenants therefore do not benefit from any of the rent control structures a state administered housing project can offer. 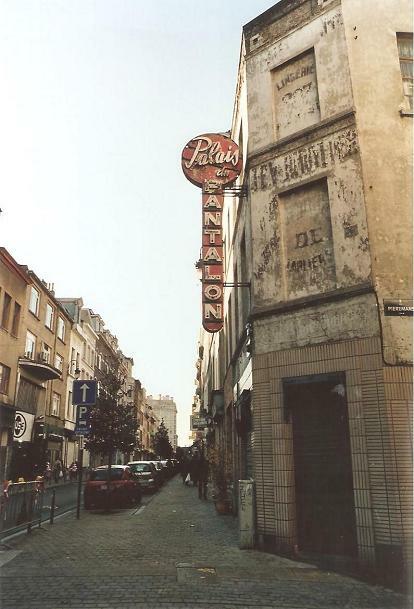 It was the state of disrepair of many of the buildings in Brussels’ inner city neighbourhoods that first caused people to move to the suburbs. Whilst the wealthiest continue to hug the edges of the city, recent years have however brought a new type of tenant to the inner city areas. Cue the words gentrification and urban regeneration, all terms which are thrown about in dialogues about cities by journalists, academics, city councils and property moguls alike, and both equally laden with positive and negative connotations. Gentrification, going back to the origins of the word, evokes images of the upper echelons of high society – literally the ‘gentry’ – swooping in and appropriating an area for their own, whereas now so-called gentrified areas are more often simply trendy and attractive to young people. The real bourgouis will still move to the suburbs or to the small pockets of incredibly expensive real estate in the inner city. The groups moving into inner city working class areas in Brussels are often more well-off than the migrant families who live there, but they are not always significantly better off, being students and young people with average professional salaries who want to enjoy the benefits of living in inner city areas where the cost of living is relatively cheap in relation to their earnings; they don’t need to run a car, they can avoid the ‘banality of the suburbs’ and they have more disposable income to spend in the various cafés and other amenities which naturally spring up to serve this new demographic. Unsurprisingly, city councils are keen to reinvest in the ‘revitalisation’ and ‘regeneration’ of these areas. The Brussels-Capital Region was created in 1989, and the first Regional Development Plan was adopted in 1995. Brussels has the image of a cosmopolitan centre, the ‘capital of Europe’, which is somewhat at odds with its many realities. Just as there is a discrepancy between Glasgow’s low life expectancy rate in many areas and its shiny ‘Scotland with style campaign’ complete with photos of shoppers gliding up Buchanan Street, the city’s main consumer artery. Cities have also recognised the value in marketing their urban decay and poverty and an imagined collective nostalgia for the city as it once was. This is evident in Glasgow, where both Council supported culture initiatives and independent artists alike use Glasgow’s industrial history as their ideological canvas. This sometimes inspires the gentrification of certain areas. Artists are traditionally held to be the ones who lead appropriation trends, moving into poor areas to take advantage of the cheap and spacious rents. But now more than ever estate agents and cities themselves are the ones who are leading these trends, keen to upgrade the image of the places around the city to attract investors. But to adopt the terminology of urban rebirth or rejuvenation implies that there has been urban decline as a result of the middle class leaving for the suburbs and poorer migrant populations moving in, as a study on Brussels’ inner-city neighbourhoods in 2007 by Mathieu Van Criekingen points out. The Brussels Regional Development Plan (2002) states that “the first ring in the western part of the city suffers from a general lack of both economic and residential attractiveness …”, better read as attracting middle-class, Belgian, family households who are taxpayers and voters is a political priority for Brussels. Legitimised, as Van Criekingen describes, with references to values such as social cohesion. 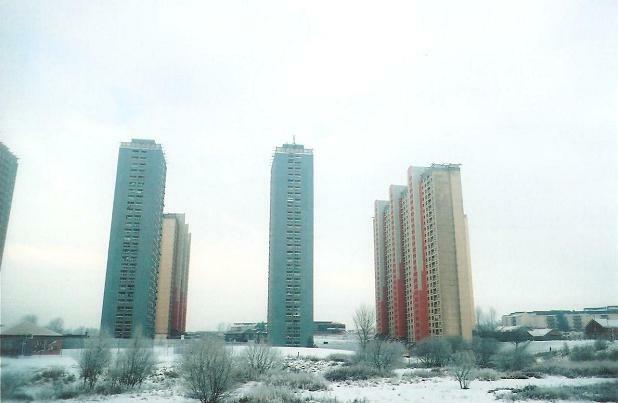 The imfamous Red Road housing estate in Glasgow. Gentrification and regeneration strategies which encourage those paying high levels of taxes to move back into the city are therefore beneficial for city councils. The incomes of the total population in the central areas of the Brussels Capital Region have little increased over the past 30 years, yet the areas surrounding the city region have tripled this wealth. Attracting some of this wealth back into the city must also be done in tandem with effective social housing policies, as rents that creep higher and higher as areas become more pricy and fashionable, devastates the most vulnerable. And with unemployment in Brussels standing well above the EU average at 19.5% – hitting the youngest and the poorest hardest – a sky-rocketing private housing market is not likely to alleviate the situation. Diverse and vibrant communities with people from all walks of life are a positive thing as having distinct poor areas and richer areas creates frustration and inequality, but equally each neighbourhood needs to focus on encouraging both a responsible private sector in tandem with a fair and plentiful supply of social housing. Pledges by the Brussels government to increase the proportion of social housing to 15% of the total stock by 2020 will require an additional 35000 homes or 3500 homes annually to be built over the next ten years. But today, the average annual production stands at barely 1500 social homes. With cities across Europe facing governments intent on stripping back as much of the welfare state as possible in favour of cuts and austerity measures, housing policies that continue to encourage communities that exist with as little state intervention as possible are worrying. Cities facing housing shortages should see it as an opportunity to use architecture and planning to build communities which promote equality with accessible amenities like new schools for the expanding populations. The exhibition Building for Brussels sets out case-study examples from Madrid, Paris, Basel, Copenhagen, Barcelona and Rotterdam, of how city authorities have supported creative approaches, lets hope Brussels, Glasgow and other cities facing problems can learn from history’s mistakes and find some creative solutions to their social housing problems too.